Shorewalk Vacation Villas is not only an ideal place to spend your vacation, but also plays host to a world of shopping, exploration, education, close by cities and a variety of entertainment. At Shorewalk, it is our mission to provide you with a remarkable experience and memories that will last a lifetime. What would a vacation to Florida be like without a trip to one of the Internationally recognized beaches? Florida is known for its white sand, crystal clear water and exceptional sunsets. Enjoy the breezy shores of Florida’s beaches and be sure to bring your camera! The Gulf of Mexico is ideal for boating, fishing and parasailing. If you like the sun, Florida’s West Coast has the whitest, softest sandy beaches anywhere. All beaches are within short driving distance from Shorewalk. For a truly unforgettable beach experience, Anna Maria Island provides a taste of old school Florida. At 7.5 miles long and 1 mile wide, Anna Maria Island Beach offers patio cafes, pubs, restaurants, playgrounds and more while providing relatively untouched natural setting. 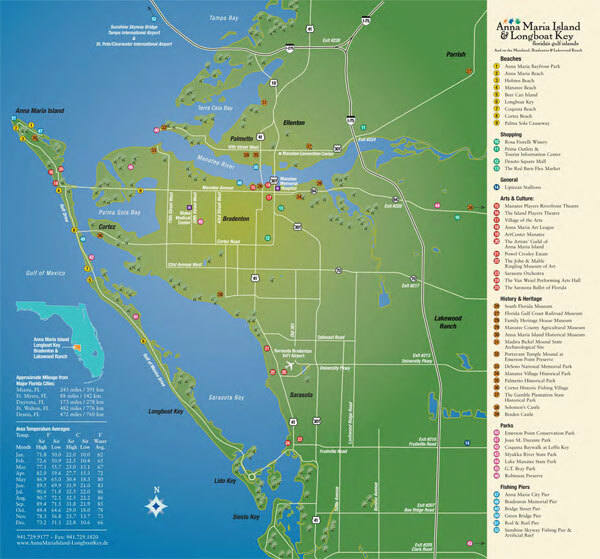 Anna Maria Island beaches include Coquina Beach Park on the south end, and Manatee Public Beach. There’s also a FREE trolley that will take you around the island for a real Florida experience. Anna Maria Island is approximately 5 miles from the Shorewalk property. Featuring breath taking scenery and the whitest sand you will ever see, Longboat Key is the heaven of beaches. With its long stretch of coastal waters and seaside affairs, Longboat Key is nestled among some of the wealthiest inhabitants of central Florida. Walk along the beach and collect seashells, and you might even find a sand dollar! Just a short drive from Shorewalk. Located in the retirement community of Sarasota, Siesta Key offers a relaxed setting for beach goers of all ages. Featuring concession stands and playgrounds there is fun for everyone! Experience some of the clearest water you’ve ever laid eyes on and make sure you catch one of the sunsets that has made this beach a famous night spot. For those of us who are avid shoppers, Florida has more than enough shopping opportunities to satisfy even the most insatiable appetite. Come experience a wide range of shopping experiences, from the largest outlet on Florida’s Gulf Coast to beach boutiques, Flea Markets, Farmer's Markets and everything in between. You will find exactly what you are looking for. Fun for the whole family, Florida is host to a wide variety of amusement parks and museums that are guaranteed to keep the fun going all day! Most theme parks are approximately a 2 hour drive from Shorewalk making day trips to major theme parks possible.